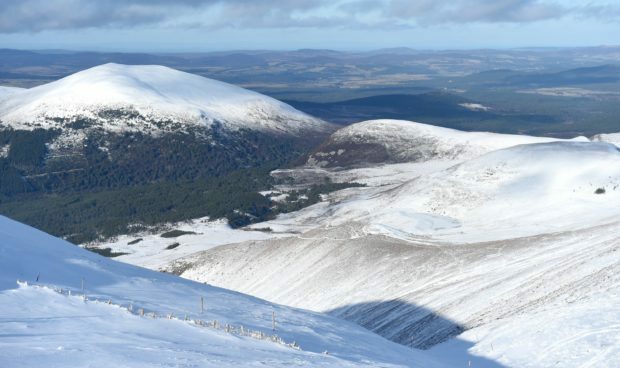 A disorientated and exhausted snowboarder survived sub-zero temperatures, snow storms and 40mph winds on top of a Scottish mountain by huddling together with his dog. The boarder from Edinburgh and the Labrador cross dog were rescued in the Cairngorms at the weekend – after being found keeping warm in a bivvy bag. Cairngorm Mountain Rescue Team (MRT) walked the pair – who were near the summit of 4,085ft high Cairn Gorm – to safety on Saturday. The boarder, aged in his 30s, raised the alarm by his mobile phone around 5.30pm and 23 members of the MRT responded. Two rescuers on skis reached the man and his dog at over 3,000ft up two hours later. The boarder was taken down by the team’s tracked vehicles and back to base by around 10pm. Al Gilmour, chairman of Cairngorm MRT said: “He was cold, scared and very aware of the difficult situation he had got himself to. “It was minus 5 or 6C with 30-40mph winds. It was snowing all the time. He was very well equipped but was starting to become overcome by the conditions and would have found surviving the night difficult. He added: “I think the dog really helped him survive. The dog was fine – but the guy was suffering in worsening weather and as darkness fell. Last week a missing dog was precariously plucked by a helicopter crew from an icy mountain the Cairngorms. A crowdfunder to thank rescuers has raised more than £1,600. Shivering in the bitter winds of Storm Gareth, Ben the cavachon would have died had he not been spotted by eagle-eyed members of the Inverness Coastguard search and rescue helicopter crew on a training exercise. As the storm clouds cleared, Ben was discovered on Wednesday near Loch Avon in the Cairngorms as the helicopter circled over the 200ft vertical drop ledge where he was stranded. Caked in snow, the petrified pet was soon winched to safety by crew members, who took him home to his distraught owners Fiona and Ian Young from Culloden near Inverness. The Youngs launched the crowdfunder to thank the rescuers. Ben had run off while on a walk with Mr Young on Monday, then spent a terrifying 48 hours lost on the mountainside as Storm Gareth battered the country. The Coastguard later posted video of Ben relaxing with rescuers at their base in Inverness, shaking the dirt and mud off his fur and clearly delighted to be back in the warm.